I am always in search of ‘The Facials Mecca’: a haven for people (like me) who are slightly addicted to the facials experience; where we will not be judged, mocked or shunned. Just pampered, treated and given aid for those giant pores, fine lines and scratchy dry skin patches. A place we can find refuge, if you will, from the toxic and stressful city environment which I know, for a fact, is to blame for my dull complexion (and not the 4pm cake runs). I was tipped off about a small but cosy and well equipped day spa on the King’s Road, and immediately, my purse began to wither and shrivel in on itself with the thought of Chelsea prices. I was pleasantly surprised however, when I walked into The Chelsea Day Spa, firstly by the elegant, clean and classy decor of the two floors and secondly by the affordability of everything on their menu. I’ve done a blog post already on their sister-spa in Fulham, and it is just as cosy! 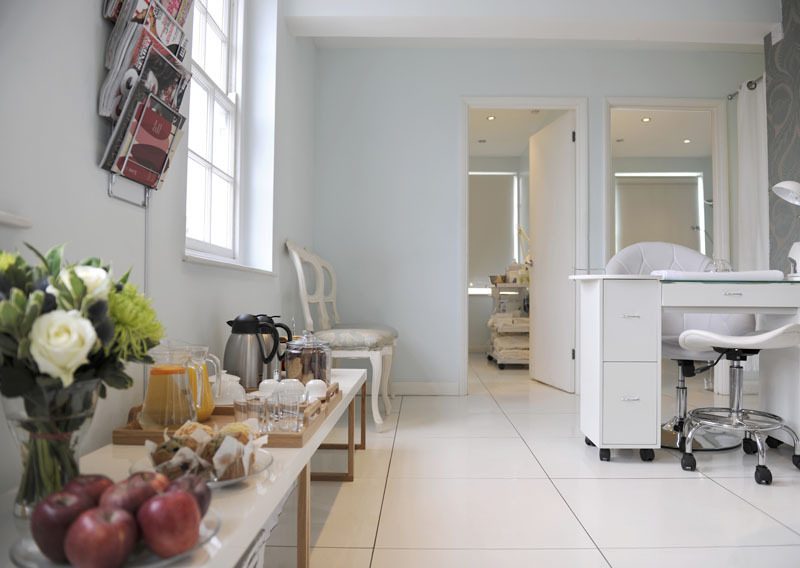 I was soon invited to lie down in their adorable treatment room and my skin was being pampered with the HydroPeptide range. Hailing from the States, the HydropPeptide range has been scientifically formulated to improve skin’s condition using dermatologically tested blends of natural extracts and key peptides. The use of peptides (tiny protein fragments, or small chain amino acids) helps cellular renewal in the skin. They tell your skin to start producing more collagen (so skin will look plumped up) while neuropetides work to relax your repetitive facial muscles, which can reduce those frown lines (but not in a ‘Botox: I only have one expression’ way). I’m a huge fan of the effect of scrubs; washing away all those dry flaky patches is a wonderful feeling. But what I’ve found in the past is that the scrub will work wonders on the bits of dry skin I have (like on my forehead) but will leave the rest of my face taut and very thirsty. Luckily, this was definitely not the case here with the HydroPeptide Polish. It’s light but incredibly hydrating, with teeny-tiny polishing beads working deep down into your pores, and doesn’t feel like you’re rubbing sand into your face either. Part of the facial treatment is a lymphatic drainage massage, which I certainly needed. Not only was I predicting a serious breakout, but around my eyes and nose were very puffy – the hayfever look is so not in, regardless of the pollen count. Finally, and quite possibly my favourite part of a facial, was the mask. Creamy and hydrating, I could feel my skin drinking it up whilst I was treated to a head massage. After a blissful hour, I was brought back to reality. Lights on, I could already see the difference. A little flushed from all the massages, my puffy eyes and nose had definitely been reduced and my skin looked clearer. It actually felt lighter, as if all the impurities had been wiped away. The real benefits came the morning afterwards. My middle-of-the-forehead line was gone (not just reduced, but gone!) and so where my 6am dark circles. Not only that, I was stroking my face all day because it was so soft and hydrated. No more dry patches, no more gigantic pores and (miraculously) those expected spots never arrived. Just one word of warning and advice at the same time: my hair did look quite greasy when it ended, which is perfectly acceptable seeing as the products had been used on my face and I had a head massage. Products in hair is to be expected. So, if you’re planning a pampering session, perhaps make it a late evening appointment so you don’t turn up for after-work drinks with hair that looks like it has been styled by grease. But the bonus of those couple of hours of greasy hair is that I think it actually made my hair glossier. You’re advised not to wash your face the night of the treatment and let the products soak in overnight before you put on makeup. Similarly, I didn’t wash my hair until the next morning and it was definitely a whole lot shinier. This is not a little-bit-of massage-here-splash-of-moisturiser-there-jobs-a-good’un-facial. It is a luxurious, pampering facial experience, which will deliver long lasting results. (I was still stroking my face a week later). The spa and the small team of miracle workers it houses, is one of Chelsea’s best kept secrets. The only problem? I just can’t stop telling people about it. The HydroPeptide Infusion Facial, £95 for 1 hour. Nikki was a guest of the Chelsea Day Spa, Kings Road. Oh it really is! I felt right at home!